Sometimes it’s all about the simple things. 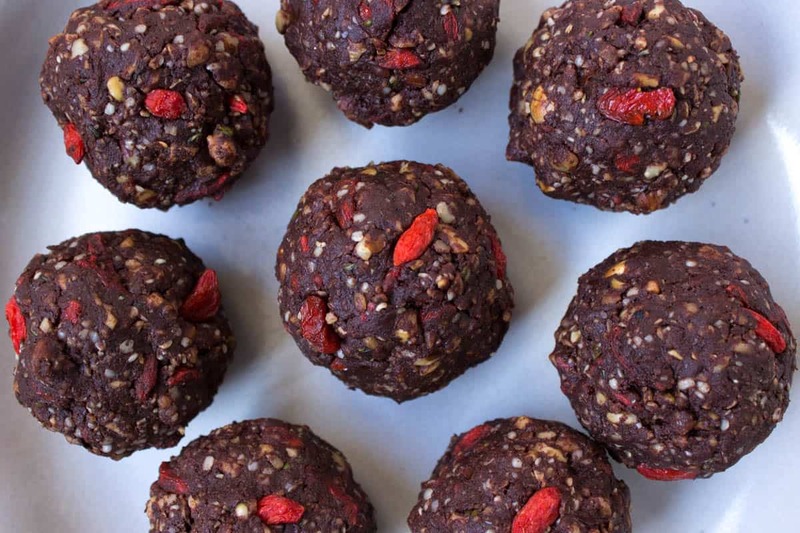 When baking a cake is too daunting or making dessert too complicated, you have to whip out the Hazelnut Cacao Goji Energy Balls. 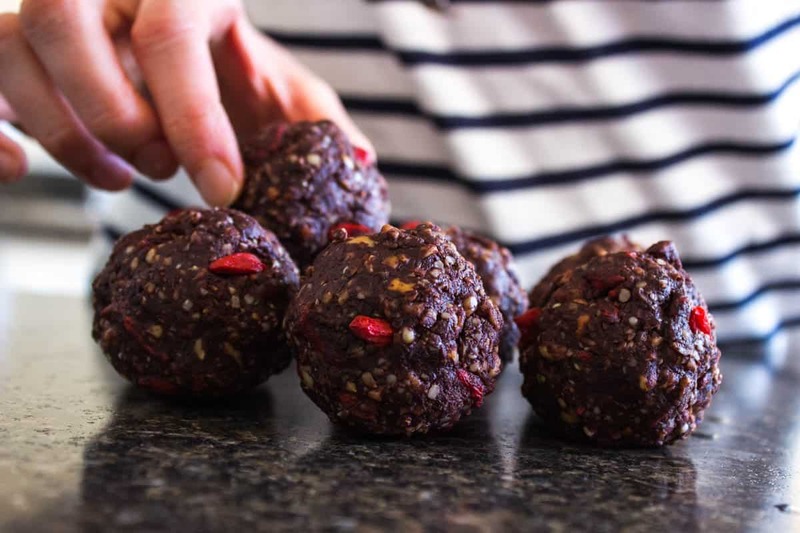 These little balls of goodness are tasty, nutritious and quick to make. 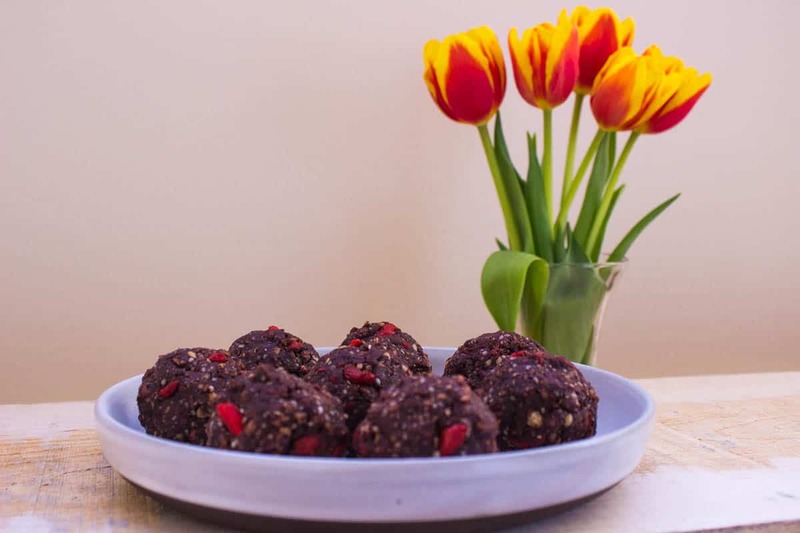 Great as a snack or as a dessert, they satisfy that sweet craving while also giving you a dose of good things (cacao, gojis, hemp seeds etc. etc.). You don’t necessarily even need a food processor to make these (although if you don’t have one you do need a blender), and can mix everything together in one bowl which minimizes the washing up! I’m a big fan of making a batch of these at the start of the week and taking them to work as a snack, or just having them on hand to munch on when I get a craving for something sweet and satisfying (they will last for about 4-5 days if kept in the fridge). They taste really chocolatey which in my mind, when mixed with hazelnuts is a winner! Using a dry frying pan or skillet, lightly toast the hazelnuts on the stovetop on a low heat until golden brown. If you have a food processor: add all ingredients to it and pulse together until a sticky mixture forms. If not: add the hazelnuts to a blender and blend on a low speed until they are chopped into small pieces. Do the same separately with the dates, then add all ingredients to a bowl and knead together with your hands until a sticky mixture forms. Shape the mixture into 4cm-wide balls, and store in a sealed container in the fridge until required. It’s that easy!